Even as Mark Zuckerberg and Facebook start to gain an increasing amount of influence all around, look’s like there are still some issues that the CEO has to solve. One of these is account security, as Zuckerberg becomes one of the many to suffer from the recent LinkedIn security breach. His Twitter and Pinterest accounts were both hacked today by the OurMine Team, who claims to have it done purely for security related purposes. Even though Zuckerberg hasn’t posted anything on Twitter since 2012, the hacking group OurMine posted statuses on of the Facebook CEO’s Twitter and Pinterest. His Instgram managed to stay safe however, despite several sources out there claiming that it also had been breached. The Instagram breach would have been more of a concern to a majority of users out there as it’s owned by Facebook itself; and the breach of its CEO’s account would have left quite a bit of folks red-faced indeed. Nevertheless, its still interesting to note that a password breach that occurred way back in 2012 has managed to affect users still, after it was reported last month that the business-oriented social service, LinkedIn’s passwords were being sold on the dark web. Given that LinkedIn’s grown in popularity with quite a bit of folks, especially those looking to form new business connections, we’re sure quite a lot of personal details of 117 million users have made it in the wrong hands. In fact, it looks like Zuckerberg isn’t quite creative with passwords either, at least as far as Pinterest goes. 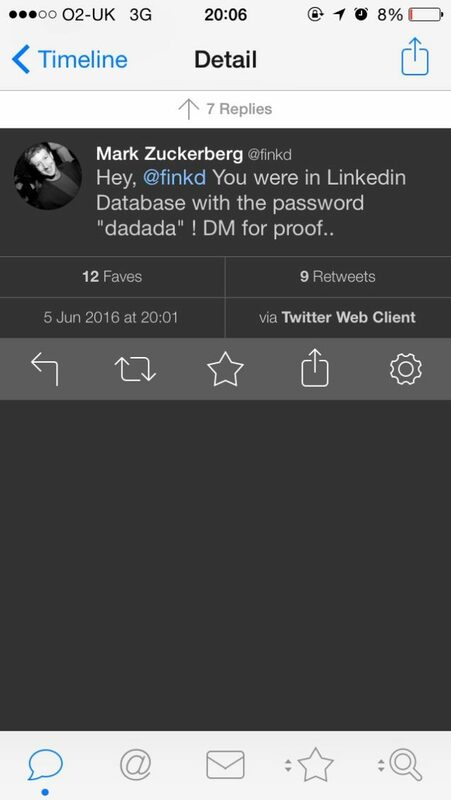 Captured by Ben Hall, OurMine’s post claims that his password was a rather simple ‘dadada’. This leaves us rather interested to find out what his other passwords are, especially given that the whole Twitter mess was cleaned up rather soon after the breach. Safe to conclude, even if social media sites don’t get to see security breaches in the future, a highly unlikely fact in itself, setting your password as repetitions of alphabet pairs will ensure that you’re hacked one way or the other. We’re hoping that Mark puts more thought in setting his passwords next time around, especially as more sensitive breaches could result in leaks with serious implications. Thoughts? Let us know what you think in the comments section below and stay tuned for the latest.